This is a recipe I think I saw on a cooking show on Food Network years ago, but it was for Chinese chicken salad. It was yummy, but another one of those recipes I probably only made once a year. And I haven’t made it in several years actually. I found a can of water chestnuts in my pantry about a week ago. I’d probably bought them with intentions of making the salad again, but just never have. So, I decided I’d do it this weekend. The best part about this recipe is that it only takes about ten minutes to make and you don’t have to chop anything. Head to the Chinese section of your grocery store and pick up a can of baby corn, a can of water chestnuts, a can of mushrooms, and a can of bamboo shoots. 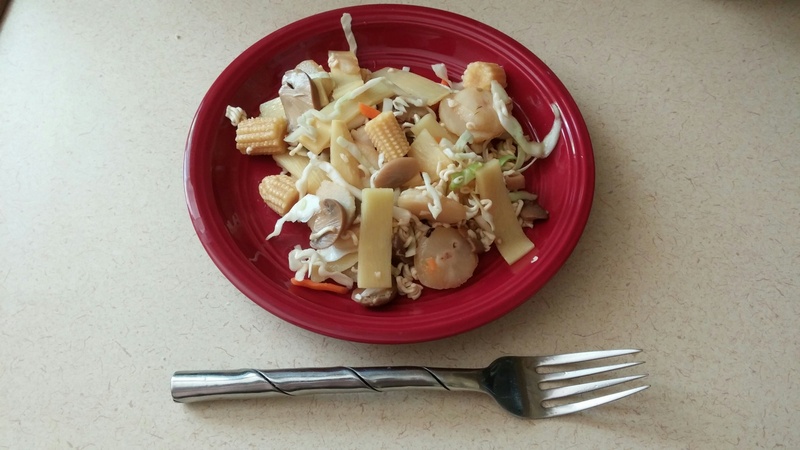 Dynasty actually makes a can of stir fry veggies that contain all of these items, except instead of corn you get bean sprouts. 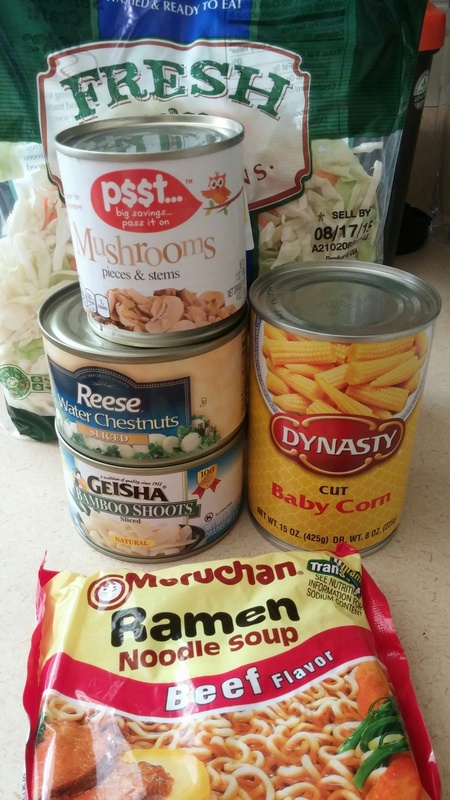 I bought this can of mix veggies for the chicken salad version, but I like the addition of the baby corn and I don’t like sprouts, so I bought everything separately for the salad this time instead of the mixed can. But you could certainly use it if you wanted, cutting your prep time down even more because you’ll only have one can to open and drain. Instead of the sprouts, I like to use a cole slaw mix of cabbage and carrots. It gives the salad a bit more crunch and I just think it tastes better than sprouts. You’ll also need one pack of Ramen noodles, not cooked and without the seasoning packet. How many of you always end up with empty packets of Ramen seasoning in your pantry? What do you do with them? Do you just add them to another bowl of Ramen and double up on the seasoning or is there some other cool recipe out there I don’t know about? I’ll have to Google that some day. The only other ingredient is soy sauce. I used Ponzu sauce this time. I’d never used it before and bought a bottle recently to give it a try. Ponzu is just citrus flavored soy sauce. It’s got a nice tangy flavor. So here we go with how to prep this salad. Open all your cans (or one can) of veggies and dump them in a colander. Toss them while washing the veggies and then give them a good shake to get rid of any extra water. Then mix them in a bowl with two cups of slaw and half the Ramen noodles. You’ll have to give the Ramen a good smash. It helps to hold the block between your palms and squeeze it. Then add about 4 tablespoons of Ponzu or Soy. You can add more to taste. The flavor gets stronger if you let the salad sit in the fridge overnight. Add a dash of salt and give it all another good toss and serve. Done! I like to mix it in a giant bowl with a lid so I can shake it up. Like I said, you’ll spend more time opening the cans and smashing the Ramen noodles than it takes to make the salad. Toss everything together and serve! Don’t you love easy instructions? Like I said, you could add chicken to this recipe if you want. It was quite yummy before when I was eating meat. But it gets even better! You get about six small servings from this recipe. Each serving is only 88 calories without the addition of chicken. It’s also very low in sugar and fat, and has 4 grams of protein and 4 grams of fiber per serving.